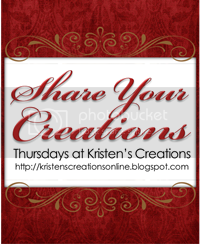 Welcome to the 5th Share Your Creations party! I hope you will participate! 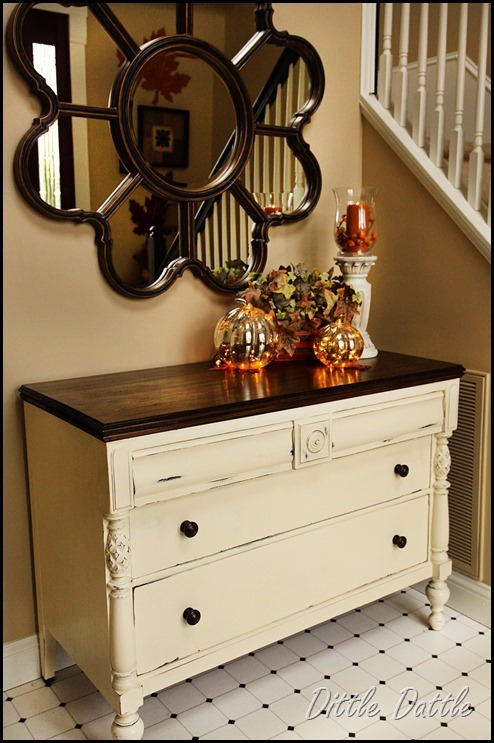 Carrie at Dittle Dattle painted this beautiful chest of drawers. 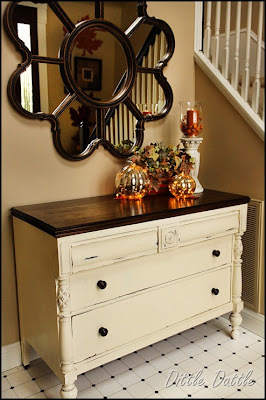 Pretty fall decor too...and mirror! 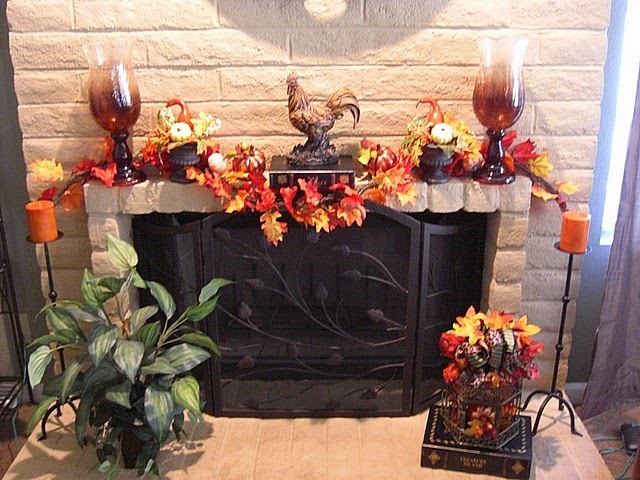 This beautiful fall mantle was created by Ally at There's no place like our home. Love this fall pumpkin tree created by Rose at Hint of Home. 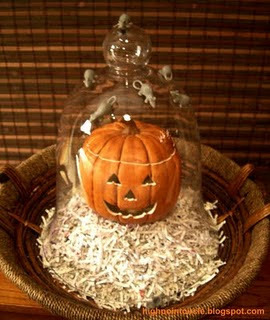 Cute idea for a Halloween party created by Brandy at Brandy's Crafts. You guys are creating some great stuff!! I'm very impressed! I am still working on my kitchen and fall decor, so in the meantime I wanted to show you some items I have recently listed on Etsy. I only have one rooster like this, but do have the hen if you are interested...she is just as pretty! This is a fancy beaded pumpkin! It has some glitter and gold balls on the top of it. I have sold a ton of these scarecrow tassels! Well, those are some of my creations that I have for sale. Click HERE to go to my Etsy Store. You can link up any item you have created, a room you have decorated, a seasonal vignette, jewelry, painted furniture etc...the list goes on and on. If you have an Etsy store you are welcome to add a link on your blog (like I did). All I ask is that you add a link back to my blog so others can find the party. Thanks!! I'm still working on the kitchen and outside...they are coming along. I wanted to show you this scarecrow arrangement I spruced up last night. I bought the scarecrow at a booth in an antique/junk mall last year for around $10. He was in a basket with lots of old looking veggies and pumpkins. I fixed him up last year and put him on my front porch. Well, when I got him down from the attic last night he was a mess! I fixed him up again and set him on the back patio. Cute little guy isn't he? 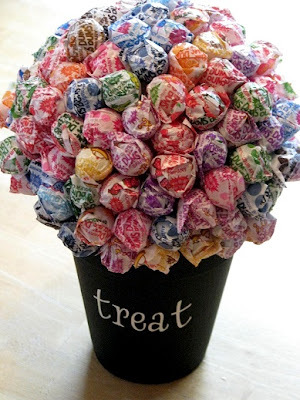 As you probably know, I made the arrangement on the table. First, I made it low, but it just didn't look right to me, besides the candle holders were way too tall and I didn't want to have to go buy anymore. Also, I think I'm just used to something big and tall there. I used all kinds of fall berries, flowers, sticks and wheat in the arrangement and added beaded pumpkins down the center of the table. When I put the candles on the candle holders they looked too plain, so I dressed them up with some ribbon and metal bird pieces that I happen to already have! I also added some fall leaves, greenery and berries around the base of the candles. I had to have a tassel, so I made myself one using fall ribbons. I have a scarecrow tassel that I am using in the kitchen. I dressed up this floor candleholder with the same ribbon I used on the tassel, a sunflower and greenery. Here are the dishes that have never been used...lol. They sure do look purdy!! The table runner came from T.J. Maxx. I love it! I brought home three before I finally found this one! Well, that's the dining room all dressed up for fall! For a tour of the living room click here. Welcome to the fourth share your creations party! I hope you will participate! First, I want to thank you all for your nice comments on my fall living room! I was blown away by all of your sweet compliments! Thank you very much!! Oh my goodness, it was hard to pick just 5! You all had some wonderful ideas. Suzy from Worthing Court has created a beautiful family room...love the bookcases! Visit Highpoint Circle for some cute Halloween and fall ideas. 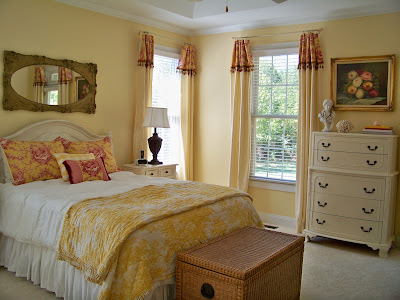 Penny from The Comforts of Home made the beautiful curtains and shams for her master bedroom. 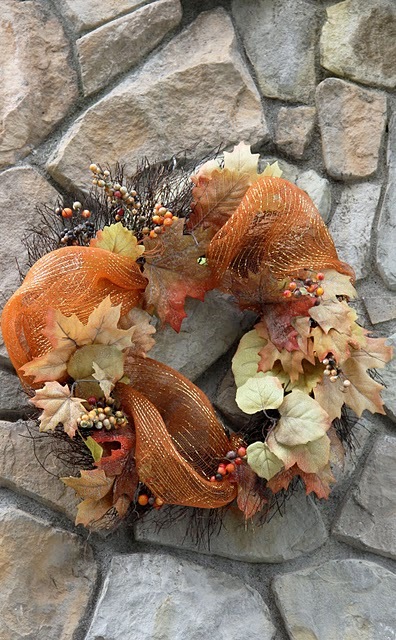 This gorgeous wreath was created by Liz at Savvy Seasons. Visit her for some beautiful fall inspiration! 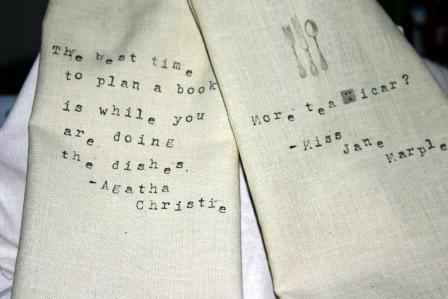 You can find the tutorial on how to make these cute tea towels at Word Up Nerd Up...cute blog name. As you know I am working on my fall decor in the dining room and kitchen. I am coming along and I'm almost done...maybe. Ha! Anyway, I brought this little birdcage down from up on top of my cabinets and decided to decorate the top of it with fall accents and ribbon. I added some moss I had left over from the moss ball and the cute little bird inside. The little bird is just precious! That's my creation! Can't wait to see yours! 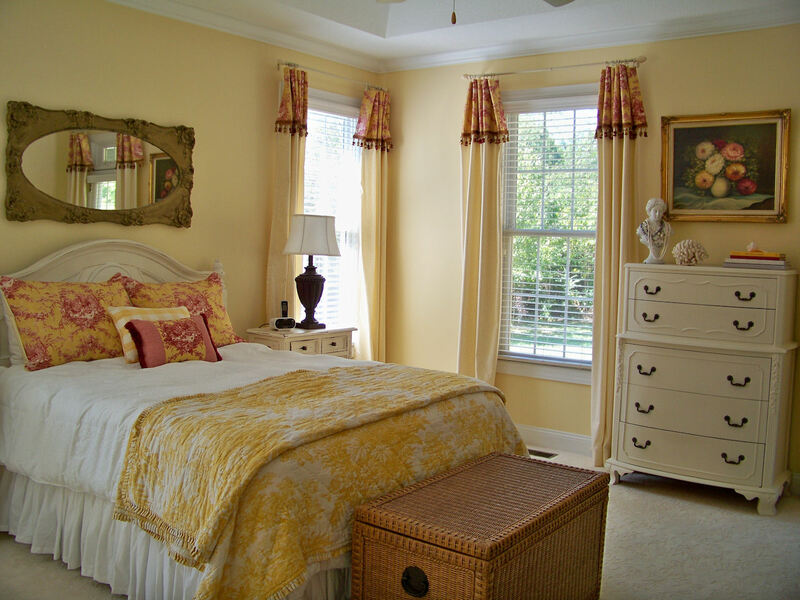 You can link up any item you have created, a room you have decorated, a seasonal vignette, jewelry, painted furniture...the list goes on and on. If you have an Etsy store you are welcome to add your link on your blog. All I ask is that you add a link back to my blog so others can find the party. After much tweaking...my living room is ready for fall! I planned on showing you the living room this weekend, but just couldn't get everything quite right. I didn't have alot of fall items and ended up making several trips to Hobby Lobby and Michael's. And now...I think I am finally done! I revised the mantle a little...it was missing a something. I added some fall leaves and smaller pumpkins to fill in and add more color. There are more pics at the end of this post. This was the table that was giving me fits! lol...I ended up making the arrangement in the trunk for the middle of the table. It's very simple with leaves, pumpkins and greenery. I bought the "Thanks" sign at Hobby Lobby. I painted it and added the stones to the corners. It just didn't show up on the table the way it was. Everything on this coffee table came from Hobby Lobby. I didn't mean for it to happen that way...lol. I tried so many things, but this worked the best. I love those big acorns in the basket. Here is the other side of the room. I made the arrangement on this table...it needed some height. I also added fall popouri and pumkins to the bowl. I just had to leave out my rabbit picture! This picture is a little dark...I brought the glass terrarium in here and added some greenery and a pumpkin along with the dogs. I wanted this table to be more simple since the others are so full. Here is a revised picture of the mantle. You can see I added the fall leaves and smaller pumpkins. I think it really brightened it up. For those of you who don't know...I painted the picture above the mantle. Still trying to get used to it...lol. Thank you to all of you who joined my party last week! There were some great entries!!! I hope you will join me this Thursday! I am joining Carrie at Dittle Dattle for Amaze me Monday, Marty for Tabletop Tuesday , Susan for Met Monday, Kim for Wow Us Wednesday, and The Picket Fence for Inspiration Friday. More Fall Etsy Store Items!